Don’t be lulled by the innocent first verse of Simon and Garfunkel’s rendition of Scarborough Fair. 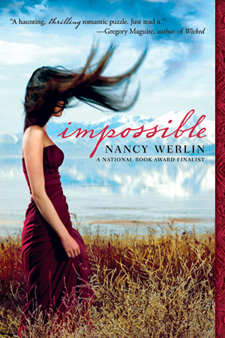 If you actually look at the lyrics, a picture appears of (presumably) a man asking three impossible tasks of a woman in order for her to be his “true love.” This is the premise of Nancy Werlin’s novel, Impossible. Lucy Scarborough’s life is pretty normal for a seventeen year-old – loving parents, her best friend Zach, high school, a prom date. Never mind the occaisional reappearance of her crazy birth mother, or the handsome stranger taking a particular interest in her life. But on prom night, everything comes crashing down. The handsome stranger is in fact the man from the song, and he has laid a curse on the entire line of Scarborough girls, bound to attempt the three impossible tasks of the ballad or go insane at eighteen. Pregnant and facing the curse’s threatening deadline, Lucy draws on the strength of her foster parents and Zach, as well as the wonders of the internet to face off with an evil that has been waiting generations for her. I was surprisingly impressed with this novel – excited to read it initially (thank you Borders closing sale), put-off when it wasn’t what I expected (no synopsis on the back cover or jacket flap), but sucked in all the same: I blasted through the majority of it in a five-hour marathon session at a coffee shop. Werlin skillfully blends the mythical frame of the story with its thoroughly modern setting – Weather.com, duct tape, and MINI Coopers are all sprinkled in the text. Sometimes references to the evil villain, an elfin prince named Padraig Seeley (a name choice which is just a shade or eight too heavy-handed, in my opinion), can feel a little disjointed or ridiculous, but that’s to be expected I think. This book was a little like watching SVU or House on TV – you can look at the clock and know that if you’re only 25 minutes in, they haven’t really figured it out yet. Impossible is a quest story involving three tasks over 564 pages, so when they solve the first task at page 210, you know it’s gonna be a while for the next two. Nevertheless, the book jogs along at a good clip, though the ending was a huge cop-out, especially after it had done such a superb job avoiding cliché previously. I don’t want to include the problem passage because it will give away the ending, but it made me want to gag, for realsies. There had also been some terrible, terrible hours with Dawn screaming and fussy and Lucy getting just the merest glimpse of how hard it was going to be, taking care of a baby, and of how the adults had all been right that, under normal circumstances, marriage and a baby would possibly not have been the right choice at this time in life. Thank you. THANK YOU NANCY WERLIN. Thus, though I had some doubts, Impossible rates an AJ on the PSA. Even if it wasn’t perhaps my most favorite book, Werlin threads girl-power messages all through it. At one point we meet Zach’s mother, who disapproves of Lucy, but remembers “the girl she had sat down at age twelve for a long talk on how important it was for girls to express themselves strongly and not be too quiet and shy.” And while there is a big plotline dealing with Lucy being in love, there is a big emphasis on it being a relationship between independent equals who genuinely care for each other. Would you consider this positive-girl/role-model-conclusion good?